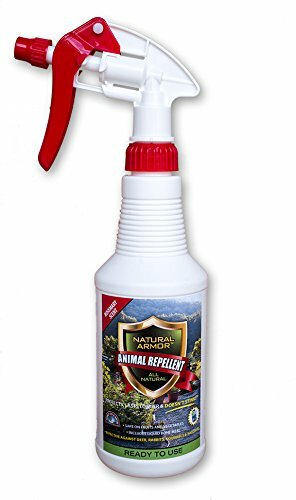 Looking for the best chipmunk repellents? Should you use a chipmunk repellent or trap? Can you use flowers to repel chipmunks? All of this and more! What About Flowers As A Chipmunk Deterrent? How Do YOU Keep YOUR Chipmunks Away? Should You Use Chipmunk Repellent or a Chipmunk Trap? Short on time? Take a look below for the top 5 in our list. Otherwise, check out our buying guide below. If you've ever watched a chipmunk in action, you'll see that between its scampers, the animal will stop and sniff the air for a moment. The chipmunk does this for two reasons: the first of which being that it's trying to gauge the air for a scent of a predator, and the second being that it's using its nose to find possible food sources. Being able to manipulate this habit and use it to your advantage is an excellent way to humanely drive the chipmunks off your property. Contrary to the noses of humans, chipmunks absolutely can't stand the smells of certain strong oils like peppermint, citrus, cinnamon, and eucalyptus. Additionally, chipmunks can't stand the smell of garlic. By using these scents in your garden as a homemade chipmunk repellent, you'll essentially "re-program" the mind of the chipmunk and make it not want to frequent that area anymore. Want to skip all this research and just hire a decent exterminator for your chipmunk problem? Click here to check out our exterminator search tool where we send you free quotes from trusted (and thoroughly vetted) exterminators in your local area. Takes about 30 seconds and it will likely save you time, money, and stress. Give it a look! A strong word of warning: moth balls have circulated the internet in the past few years for their effectiveness at warding off unwanted animals. However, we highly advise against the use of chipmunk repellent moth balls due to the toxins inside. Moth balls bear a resemblance to candy, which means that children can easily mistake this poison for something edible. Part of the fun of being a chipmunk is tearing up the gardens of unsuspecting nearby dwellers. Many people think that certain types of flowers exist which can scare away chipmunks but in fact, this is not the case. Chipmunks are very attracted to plants in general, so trying to find one that deters these creatures is a fool's errand. However, this doesn't mean you can't trick a chipmunk with a plant. First, buy a plant and devote it solely to warding off chipmunks. Make sure to place this plant away from your other plants that you actually like. Wait for the unsuspecting chipmunk to come and realize that it's a trap! Rinse/repeat this and it will reprogram the chipmunk's instincts and it should--with enough trial and error--steer clear of your garden in the future. Being such a small animal, fear is a huge motivator in the eyes of a chipmunk. This species is always on the lookout for a predator, and always on defense. Anytime you can make a chipmunk feel as if its life is at stake, your chipmunk will feel the need to flee. This truly is the best way to get rid of chipmunks. Well, as stated before, the nose is powerful. When chipmunks sniff the urine of a predator, they are instinctively driven away. Now, we're not suggesting that you hand-deliver the urine of a larger animal, but you can take some effortless steps to getting some powerful scent in your yard. For instance, if you have an indoor cat, let it outside for a few minutes to use the bathroom. Likewise, the urine from a dog can do the trick. 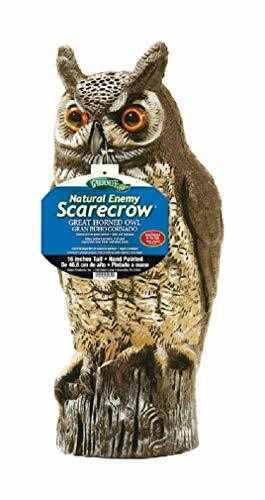 If there are no pets available to create the scent of urine, you can go the old fashioned route: purchase a realistic-looking owl to stare down your yard and drive off the chipmunk population for good. While the two products sound the same, they produce drastically different results. With a chipmunk repellent, you are simply using a type of formula or a scare tactic to make your yard feel uninhabitable to chipmunks. No harm is done, and you can rest easier at night knowing that no chipmunks were hurt in the efforts to clear your garden. A chipmunk trap, however, takes different measures. Not all traps are designed to kill the chipmunk, but there is always a notion of captivity involved. With that said, chipmunks can sometimes panic inside of a trap and harm themselves. You may have to resort to this type of measure if your chipmunks aren't responding well enough to the repellents and wreaking too much havoc in your yard. This yard installment uses a low frequency of ultrasonic waves to irritate chipmunks and make them flee. This won't harm them (or pets), so you can take solace in the knowledge that you'll be treating these animals with care. This spray is designed for those looking to protect a garden or immaculately-kept lawn. The formula is non-toxic and smells of comforting spices, which deter chipmunks and keep them away from your plants. These 2 oz tubes hold a gas cartridge which kills all species of small vermin, from gophers to mice and everything in between. The tubes are crucial in delivering gas to the burrows of a chipmunk colony, which will drive them away from your home. This realistic-looking owl statue stands at 16" and watches over your garden, scaring away chipmunks without the use of chemicals. Its glowing eyes act as a natural deterrent against all kinds of pests, and will scare chipmunks as a potential predator. When you have had enough of chipmunks, a repellent is the first step in making them go away. Some repellents will work better than others; it's simply a matter of environmental factors and how smart your chipmunks have evolved to be. You don't have to be a chipmunk killer. When you're looking to humanely drive off chipmunks, take our advice: use a trusted product. These are tried-and-true repellents that get the job done safely. A beautiful, rodent-free yard is within your reach! 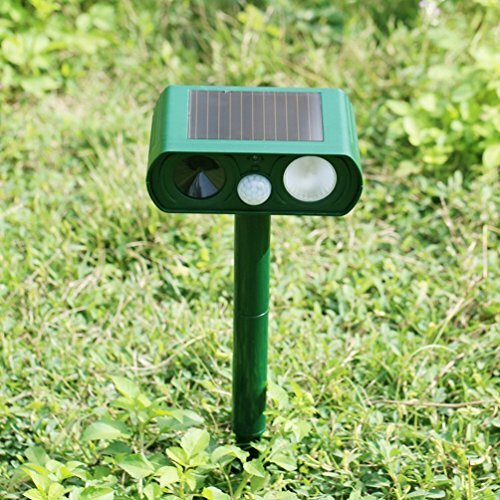 ​CAMTOA Ultrasonic Animal Solar Powered Pest Repellent is the go-to in our eyes for all your chipmunk repellent needs. Not only do you just set it up and let it do the work for you, but this device will ward off other species of nuisance animals which could be attracted to the scents you’d likely be spraying to shoo away the chipmunks! Say goodbye to holes in your yard, chewed-up wires in your vehicle, and uprooted plants in your garden. This solar-powered device will make the chipmunks flee and allow your peace of mind to return. For other ultra sonic repellers, check out this guide. Curious about other chipmunk related products? Check out our other detailed guides to help you deal with your pest problems.